U.S.-China solar trade war: SolarWorld case is bad for green jobs. A spat between the United States and China threatens the future of solar power. 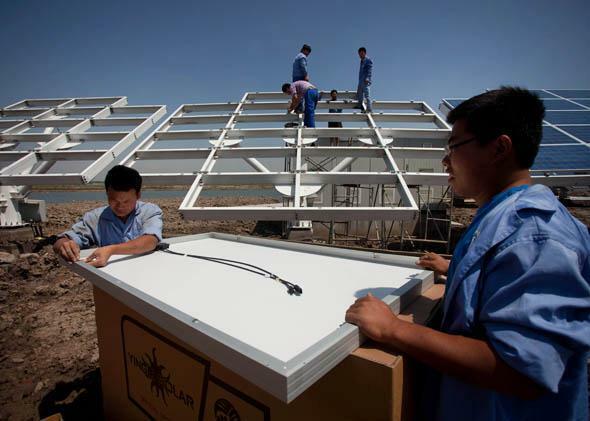 Workers install Chinese solar panels near Tianjin, China, on June 11, 2012. Solar power is an environmentalist’s dream, but for decades it was too expensive to be practical. In the past few years, that has finally been changing. Americans are signing up in droves to put panels on their roofs, not only for the good of the climate, but because—once you factor in government incentives—it’s often cheaper than conventional electricity, especially in sunny states. That was unimaginable only 10 years ago. The boom has been fueled by cheap solar panels from China, which has been heavily subsidizing solar manufacturing. The glut has been good not only for American customers, but for U.S. companies that install solar panels. Startups like Sunrun and the Elon Musk–backed SolarCity have grown explosively by installing Chinese-made panels on U.S. homes and businesses, often through financing mechanisms that require no money down. * As a result, the solar industry has been a bright spot in the U.S. economy, with jobs growing by 20 percent a year. It now employs 140,000 Americans and counting, and is one of the few sectors in which President Obama’s promise of “green jobs” has actually materialized. But the good times could be coming to an end. It’s not that China is cutting off the supply of cheap panels. It’s that the United States is threatening to slap new tariffs on them that could sharply drive up the price. It would also likely prompt China to retaliate with more duties on U.S.-manufactured polysilicon, a key ingredient in those panels. The push comes from America’s small and struggling domestic solar-panel manufacturing industry, which can’t compete with the discounted wares from China. Ironically, it’s a German-owned firm, SolarWorld AG, whose U.S. division is lobbying for the federal government to protect it from foreign rivals. On the other side are U.S. solar panel installers that rely on Chinese goods. As analyst Eric Wesoff once joked, one side is wearing an American flag over a German flag, and the other has an American flag draped over a Chinese flag. Legally, countervailing tariffs and anti-dumping duties may or may not be justified—it’s always hard to tell with a mixed-market system like China’s. But from an environmental perspective, they’re likely to do a lot more harm than good. And from an economic perspective, they’re just plain bizarre. Remember, the U.S. government wants Americans to buy solar panels, and it subsidizes those purchases through rebates and incentives. The Chinese government wants Chinese companies to build solar panels, and it subsidizes their manufacture. And yet rather than celebrate this fortuitous arrangement, the world’s top economic powers find themselves on the brink of a trade war that could cripple a promising industry in both countries, kill jobs, and hurt the environment all at once. It’s a terrible trade-policy trifecta. There’s still time to avert the worst impacts of the misguided imbroglio. But that would require SolarWorld CEO Frank Asbeck and his counterparts in the solar-panel installation industry, including SunEdison founder Jigar Shah, to stop posturing and find some common ground. And it would require the Obama administration to display some common sense and negotiate a settlement with China. So far, common sense has been in short supply. The dispute centers on the Chinese government’s aggressive promotion of its solar-panel manufacturing industry. Almost nonexistent in 2000, that industry has surged past Japan, Germany, and the U.S., and now dominates the global market. But China’s supply overshot demand and prices dropped sharply. That has been great for U.S. consumers and installers. For manufacturers, not so much. SolarWorld headed up a coalition of manufacturers and pressed the U.S. government to take action, alleging that China’s subsidies amounted to unfair government interference and that Chinese firms have been “dumping” their panels on the U.S. market at below cost. They scored a win in 2012, when the U.S. Commerce Department agreed to impose tariffs of 24 to 36 percent on Chinese photovoltaic panels. As it turned out, though, the duties did little to stem the flow. The Chinese manufacturers simply outsourced part of the production process to Taiwan. So SolarWorld brought a new suit this winter asking the government to broaden the tariffs and extend them to Chinese panels made in Taiwan. Last week, the U.S. International Trade Commission agreed to move forward with the investigation; it’s scheduled to issue a preliminary ruling on March 28. This time, the decision could have big implications for the American solar industry. Solar panels would get more expensive. Solar panel installers, which employ far more workers than U.S. manufacturers, would suffer. On top of that, China would almost certainly retaliate with new tariffs of its own on U.S.-manufactured polysilicon, a key ingredient in solar panels. That’s what it did last time. All that to try to even the playing field for a U.S. solar manufacturing industry that probably wouldn’t be competitive on the global market anyway, especially since conventional photovoltaics have become almost a commodity. “The U.S. is very unlikely to ever be the world’s supplier of panels,” says Mark Thurber, associate director of Stanford University’s Program on Energy and Sustainable Development. “Lost-cost manufacturing at volume is just not going to be our strength.” And remember, the company that stands to gain the most isn’t even American. There may be some truth to Asbeck’s contention that China intentionally drove down the cost of panels in order to give its own companies a stranglehold on a fast-growing market. Or it could be that China simply misjudged the demand, building too much capacity too fast, with the result that its manufacturers were forced to cut prices or go out of business. Many have folded. The U.S. is justified in wanting to ensure that China isn’t just flooding the market in order to corner it. But it would be far better served by addressing the problem through negotiation than a new round of punitive duties. That’s what the European Union did in a similar case against China, which it settled last year without irreparable harm to any of the parties concerned. China itself appears perfectly willing to pick up the phone. Why hasn’t Obama?